For a decade, Deb Fry managed military contracts at U.S. Central Command on MacDill Airforce Base. "When the troops pulled out, contracts started disappearing," said Fry, 58. She left MacDill in 2011, took some time off and then picked a new place to work: at parties. The onetime defense contractor is now a TapSnap franchisee. "Some people call (TapSnap) a futuristic photo booth," said Fry. "There are no walls, no ceilings, no black curtains." Instead of a booth that people pile into, TapSnap has a camera mounted to a white 42-inch monitor on a stand. Guests at weddings, bar and bat mitzvahs, nonprofit benefits, corporate events and other parties stand in front of it for photo-ops. "Think of it as a giant iPad," said Fry. There are digital props to drag and drop into place on the monitor, and a green screen option so guests can pick backgrounds for their photos. "You can be in Paris in one picture and in London in the next," Fry said. More people can stand in front of the camera than can fit in a booth, Fry said — her record so far for people in a picture is 20. The camera is also accessible to people who are in wheelchairs; cameras in traditional booths aren't, Fry said. TapSnap can brand photos with the event host's logo, and print 4- by-6 inch color, black and white or sepia copies for free for guests on the spot. After guests pose for photos, they can post them directly to Twitter or Facebook from the TapSnap monitor, and email them to themselves. "The social media concept attracted me," Fry said. 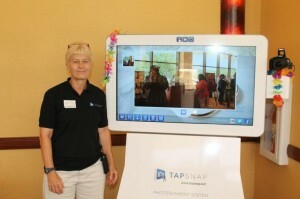 TapSnap is "innovative, which gives the client a lot more than walking into a little box and taking a photo." For information about TapSnap, call (813) 695-4259 or visit tapsnap1018.com online. Source: Spenceley, Arleen. "Lutz Businesswoman Brings 'Futuristic Photo Booth' to Parties." Tampa Bay Times, September 2 2014.